Are you worried about your little girl’s developmental progress? Don’t worry, you’re definitely not the first parent to be anxious about how their child is doing. It’s natural and it would be more worrying if you weren’t. We all want to know that our children are learning and on the right track at an early age. Playtime is an important way to encourage development and learning. But do you know what the developmental milestones are for 6-year-old girls? Let’s have a look and see if she’s learning like others of the same age. We’ll also share some of our favorite toys for 6-year-old girls. Use the links above to check the latest prices or read our in-depth toy for 6 year old girl reviews below. Everyone wants their little girl to grow and develop at the same pace as other kids the same age. So, let’s take a look at what they are. Remember, though, not all children advance at exactly the same pace in every area (source). Can talk in complete sentences, usually five to seven words. Able to understand a series of commands. Starts to laugh at jokes and understand puns. May be able to write simple stories. Has the curiosity to work out words she doesn’t know. Can concentrate and focus on a task for around 15 minutes. Has begun reading and can do this independently. Can understand what’s right and wrong. Begins to tell the time (source). Can be defiant about independence from parents. Is learning to share with friends and teamwork. Starts to talk about how she feels (source). Wants to choose her own clothes and accessories. Is becoming better at drawing. Holds and uses scissors and other tools properly. Ties her shoelaces with no problem. Works with intricate and small items. Has a lot of energy, and needs exercise to let it all out (source). Might start to show early signs of athleticism. Is confident at jumping and skipping. Has strong hand-eye coordination during sports. Hobby and creative toys: 6-year-old girls love to be creative. The good news is that there are a lot of toys out there that allow them to enjoy arts and crafts. This may help your girl develop hobbies and interests, as well as work on artistic and fine motor skills. Sharing and multiplayer games: Your 6-year-old is likely to have best friends that she likes to play with. She’s also learning to understand feelings and the workings of relationships. A multiplayer game is a good way to work on these emotional and social milestones. Active outdoor toys: You’ll probably notice that your 6-year-old is full of energy. This is the best time to make sure she is active and healthy, while she’s young, setting her up for good habits in the future. Do this with active outdoor toys, such as bikes or scooters. It can be overwhelming when you walk into a toy store and are met with so many choices. It’s difficult to know what ones are appropriate for 6-year-old girls. That’s why we’ve reviewed some of the best toys for you to choose from. This is going to make sure playtime is also learning time. Let’s get started. 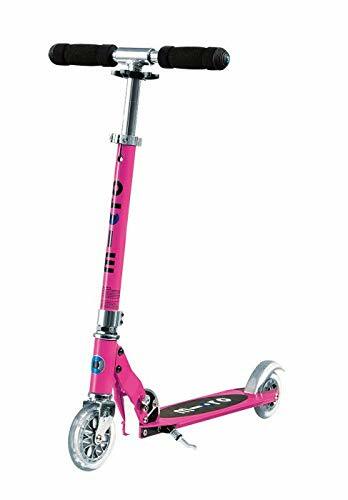 If your little girl is active, check out this cool two-wheel scooter that’s suitable for 6-year-olds. 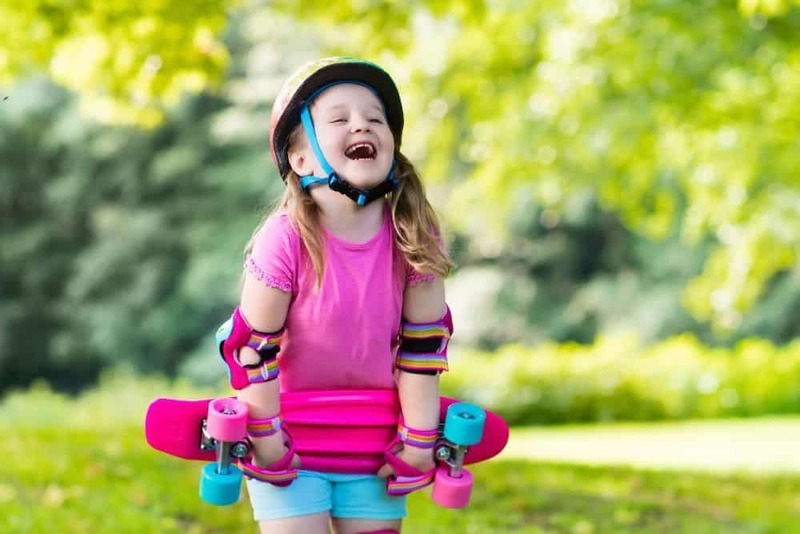 Its quality polyurethane wheels allow for a smooth gliding action when your daughter pushes with her legs. Plus, the scooter has a solid construction to avoid shaking, which may lead to accidents. There are different colors to choose from. This includes pink, metallic purple, and green, so your girl can choose the one she loves. The scooter is lightweight and foldable, which means it’s easy to stow away and bring with you on trips. Also, the kickstand means that it can stand upright. This is a good feature if she wants to take a break from all that fun. The height-adjustable handle is the perfect feature for growth spurts. Don’t forget a helmet and other protective gear as you see fit. At the age of 6, girls may be becoming more artistic and showing off their drawing skills. 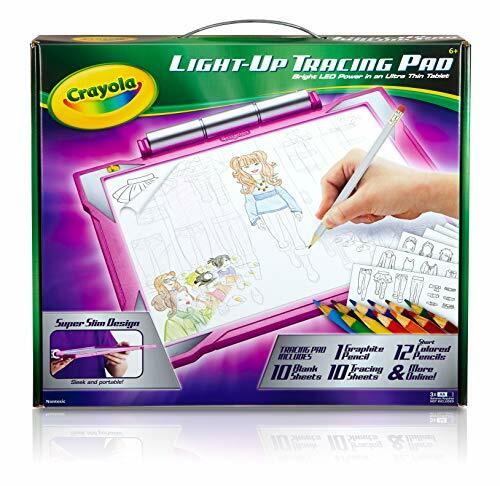 One way you can encourage this is with this light-up tracing pad. This is a great toy for using at night, with the bright LED drawing surface. Almost everything you need is provided. This includes 12 different colored pencils, 10 tracing sheets, and 10 blank sheets. There are over 100 downloadable images that your daughter can trace over. This is sure to keep her amused on a rainy day and bring out her creative side. Batteries not included. 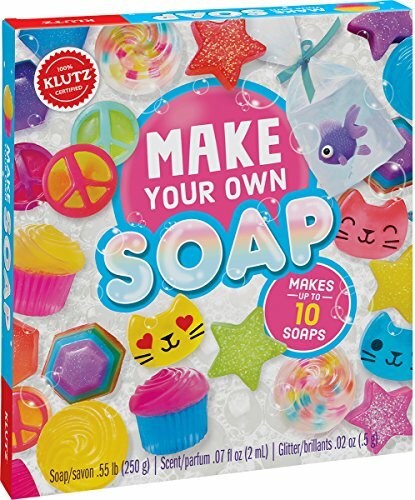 For girls that love to be inventive and artistic, check out this soap making kit. Now kids are going to enjoy bath time, as they can use their own colorful, fun soaps. They smell good and there are even glitter versions for a sparkling good time. She can make up to 10 soaps, including cats, stars, and cupcakes. There are instructions to follow, which will tell you what you need. You can enjoy this experiment and guide her through the process at first, and then see if she can take over. Included with this kit are six soap molds, 20 blocks of soap base and 20 color tablets. There’s also some fun glitter, a sweet papaya fragrance, and stickers. Gift wrapping materials are included if you’re giving this as a present. A lot of little girls adore bright colors and art. 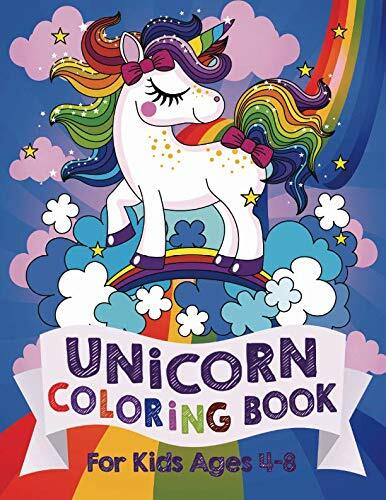 Now they can enjoy coloring in cute images of rainbows and unicorns with this coloring book. All pictures are printed on one side so that they can cut them out and display them. You’ll have to use your own crayons or coloring pencils for this book. But there are 48 pages to keep your child amused when you’re traveling or on a rainy day. There’s even a spare page for each design. This is great if kids make a mistake and want to start again. It’s also ideal for when children are sharing this coloring book — no arguments. If you want to make drinking water fun, this may be the toy that can do it. 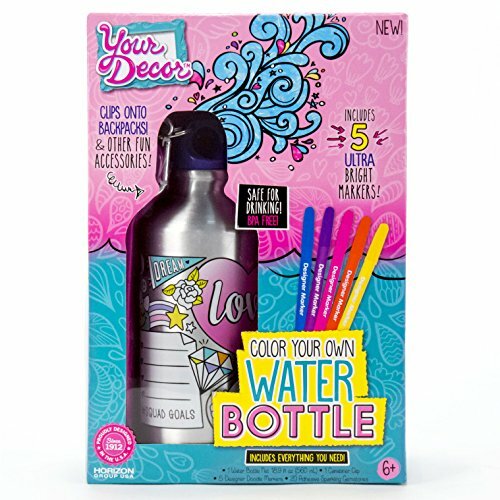 Your 6-year-old girl can now decorate her very own water bottle just the way she likes it. This is an exciting activity that lets them enjoy a personalized accessory afterward. One thing we appreciate is that the water bottle is BPA-free. This means it’s a healthy way to hydrate. Your girl can use brightly colored markers (included) to color in and create patterns, and then decorate it with the adhesive gemstones provided. Included is a carabiner clip, convenient for clipping onto a backpack or purse. If you want to help your 6-year-old work on her problem-solving skills, take a look at this vibrant puzzle. This one encourages your daughter to put her thinking cap on and concentrate to join all the pieces together. 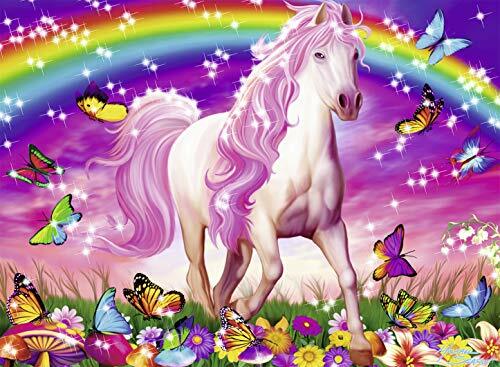 The image is of a colorful horse with a flowing pink mane, radiant flowers and a vivid rainbow in the background. The glittery pieces make this jigsaw puzzle even better. The good thing about this puzzle is that every piece has a unique shape. In total, there are 100 pieces. Are you looking for a fun activity to enjoy with your daughter? 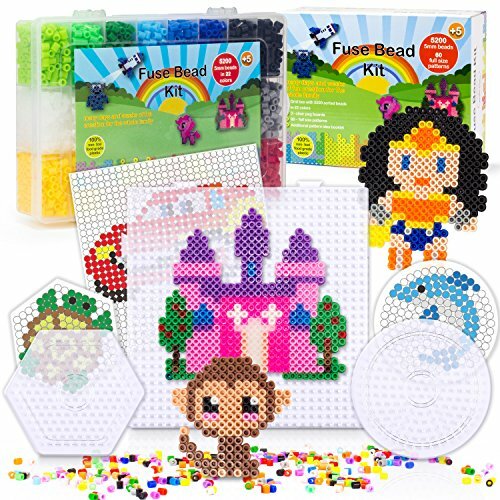 This fuse bead set may be just what you’re looking for. You and your child can create colorful patterns with the help of the peg boards, then iron them into a molded shape for memories. It’s made from non-toxic materials, with a booklet of designs and ideas. You can let your 6-year-old take charge of creating the designs, while you iron the beads in place. This is a good toy for weekends or rainy days. In total you’ll receive 5200 colorful beads, so you don’t have to worry about running out anytime soon. If your girl likes to draw, doesn’t mean she can’t just because you’re traveling. Instead, she can enjoy this geometric drawing toy from Spirograph, which will transport you back to your childhood, too! It’s designed for travel, which means you can bring it anywhere. There are six drawing wheels and two pens included, as well as 24 sticky note pages. There’s also a design guide so you can look at the patterns and gain some inspiration. 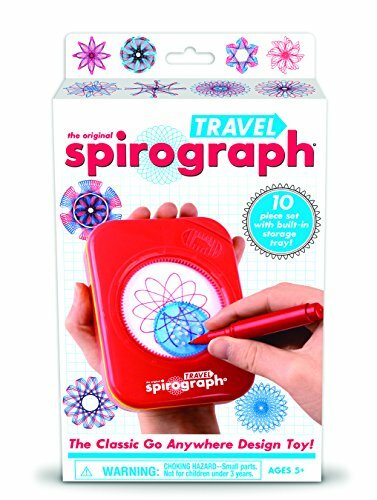 What’s more, everything for Travel Spirograph is contained within a compact case, so it’s easy to store and bring with you on vacation. Your 6-year-old girl may already be showing her own fashion sense. So, why not let her create her own clutch bag? 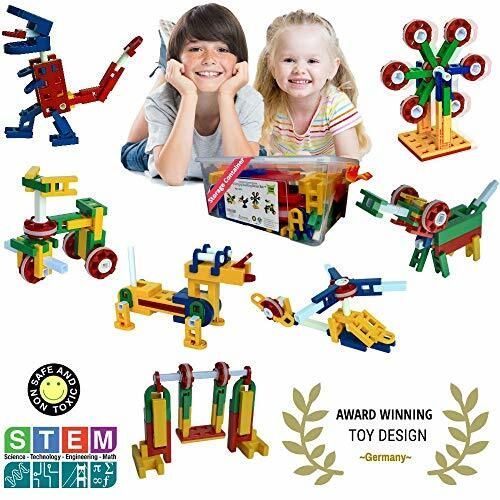 This toy encourages kids to be bold in their decision making while creating a functional item. 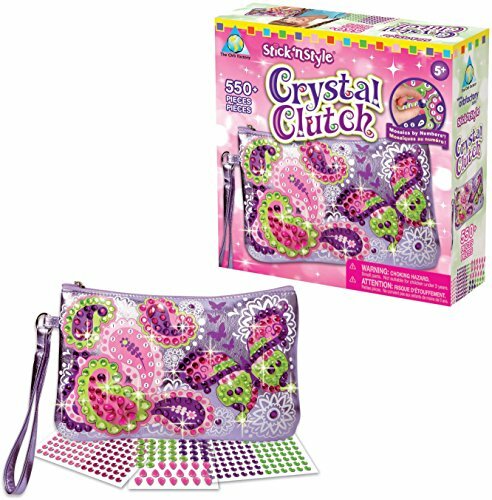 There are over 550 sparking jewels and gems that can be attached to the clutch bag to make it pretty. They’re sticky, which makes them easy to attach, with no glue required. There’s a guide included with this kit, to give your little girl some inspiration. It also teaches her about the different shapes of the jewels and gems and their meanings. Looking to work on basic math? 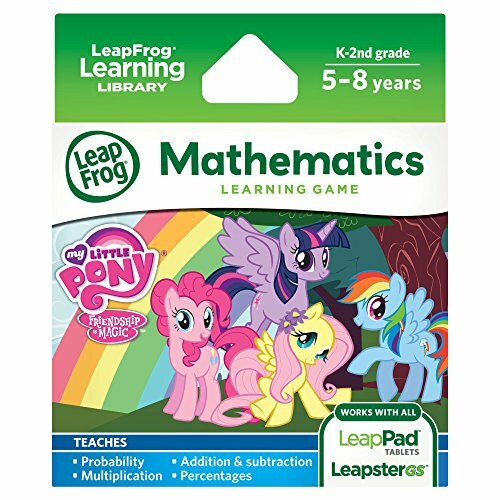 Well, you can start with this exciting My Little Pony learning game. The idea is to help the ponies complete their missions. Your little girl can work on counting, subtraction, and probability through colorful fun games. There are charts, graphs and diagrams to help her with problem solving. This game is compatible with the LeapPad learning tablet, Leapster Explorer or LeapsterGS (not included). This scrapbook is all about self-expression. Now your 6-year-old can express how things and events have made them feel and share these memories with you. Plus, they can have some fun with it. This kit comes with everything your little girl needs. 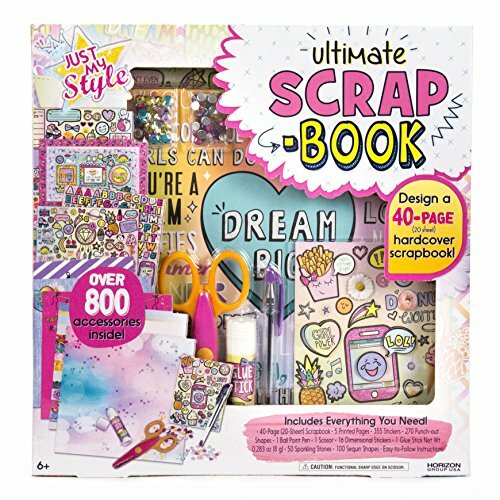 This includes a 40-page scrapbook, over 500 cartoon stickers, colorful gemstones, and sequins. There are also tools, such as a ballpoint pen, glue stick, and scissors. In total, you’ve got over 800 accessories to choose from. 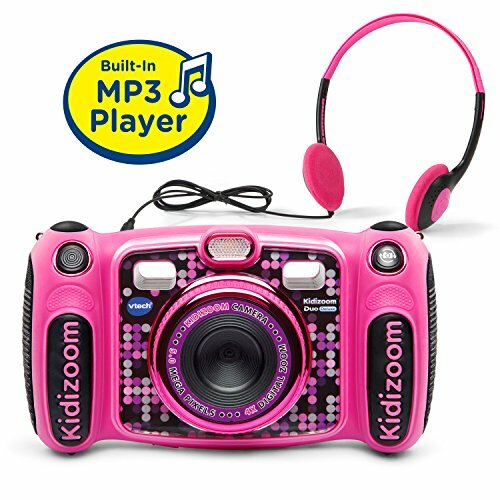 Electronics are a big part of children’s lives now, so why not let your 6-year-old enjoy her first digital camera? She can use the bright pink 5-megapixel camera to capture the wonder around her. It has a 2.4-inch color screen, 4x zoom, and a front-facing option for selfies. This camera also features an MP3 player with headphones. The 256MB of internal memory is great for storing short videos or lots of photos. It has an expandable memory slot for even more storage — it will take a microSD card (not included) up to 32GB. Battery life isn’t a problem since there’s an automatic shut-off feature after three minutes of no use. Games are also included, with a parental-control option. These building blocks can help develop problem-solving skills, with 106 interlocking pieces included. Create many constructions from planes to elephants, all tucked away into a plastic storage box when it comes to cleanup. They’re free from harmful lead and phthalates, as well as BPA-free. This means that your child can play independently and you can enjoy peace of mind. An illustrated instruction manual is included. Do you remember when you used to make friendship bracelets and swap them with your friends? Perhaps this will be a good toy for your little girl to enjoy with her friends, too. 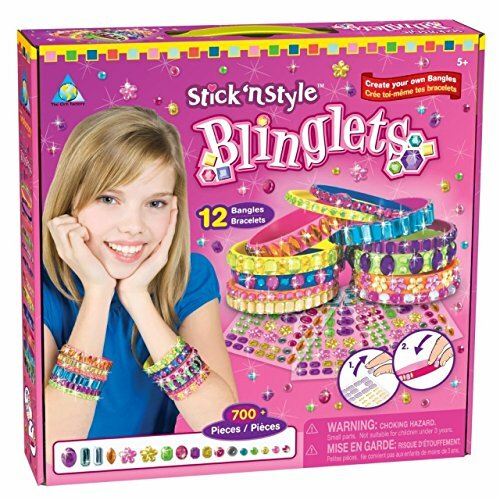 This box includes everything you need to make your own jeweled bracelets. There are 12 different colors to choose from and they can be easily decorated with the jewels and gems included. This is sure to make them popular. With over 700 stickers are included, there’s plenty to go around. This game is all about visual perception and concentration. The idea is to spot the matching letter or symbol between two cards as fast as you can. 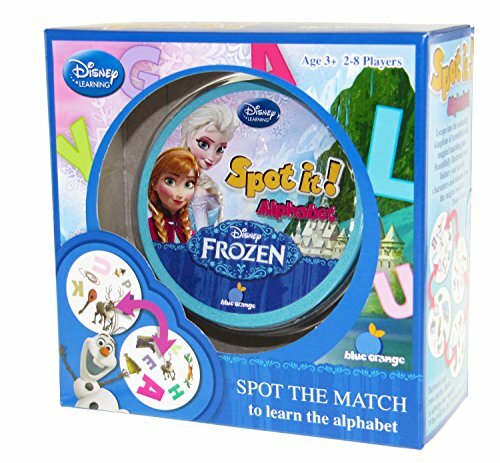 Your little girl will have to concentrate, and it’s made more exciting with her favorite Disney Frozen characters. What’s more, this is a fantastic game to bring on vacation and when you’re visiting friends and family. It comes with a compact tin to keep all of the cards in. This one is so much fun, you’ll want to play it with the kids. Are we there yet? Well, this traveling game is going to be a lifesaver. You can now keep your little girl amused even when you’re in the car. This idea is that they choose a card and have to find this object while traveling. There are 54 cards, which include restaurants, tow trucks, motorcycles, etc. 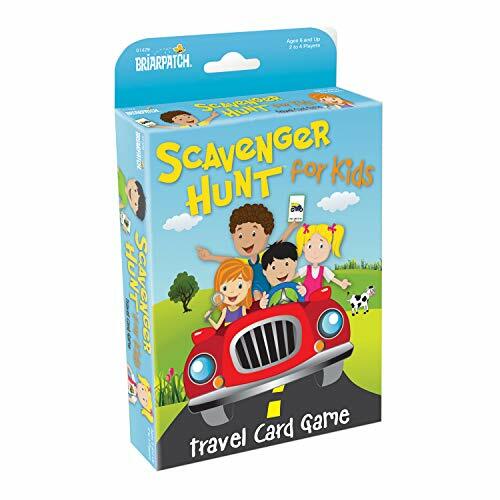 With many different things for your kids to spot, they’ll soon beat the boredom of a long car journey. With special “Hear it,” “Smell it,” and “Feel it” cards, it’s so much more fun than a traditional “I spy” game. Lego is a brilliant way to encourage creativity and practice fine motor skills at any age. 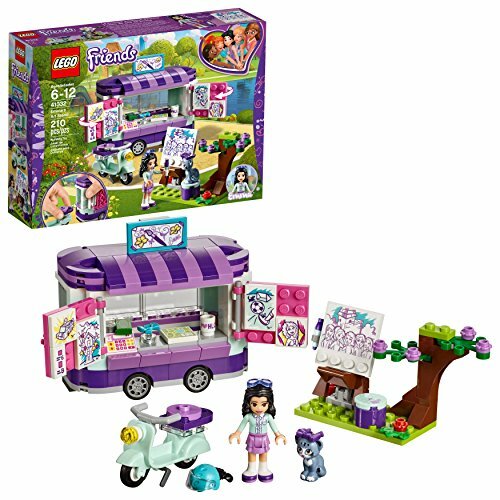 This 210-piece set lets your daughter create an art stand, as well as play with a scooter and pet cat. All of the pieces are simple to connect and fun for 6-year-olds. Once built, it’s an opportunity to enjoy roleplay and have fun with Emma and her artwork. There’s even a sticker sheet included, so that your little girl can customize the set. 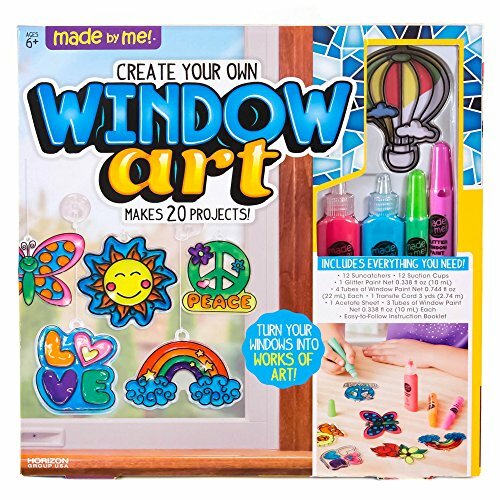 Your 6-year-old can decorate her bedroom window with colorful and fun suncatchers. This means that when the light shines in the window, they’ll illuminate even more. There are 20 projects included. This is a great activity to keep your daughter amused in the summer. She can trace the illustrations and use the paints to make unique designs. They’re easy to stick to the window with the help of suction cups (included). There’s an instruction booklet, as well as window paint, glitter, and more. All supplies are provided for this sweet project. Is your girl a fan of unicorns? Sparkles can calm and comfort your child with its weighted construction. 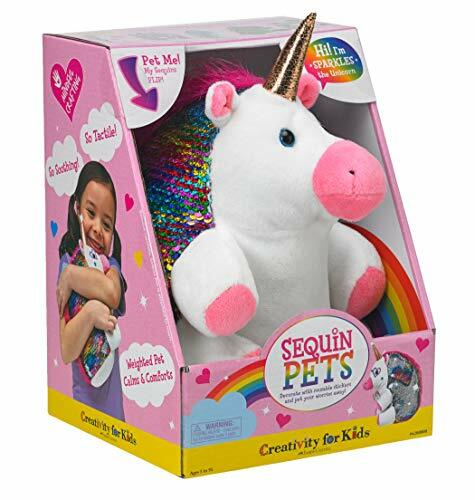 Since it’s a plush toy, Sparkles is super soft and cuddly, with brightly colored sequins. This toy may even help your child learn how to take care of a companion and work on nurturing skills. There are reusable stickers included so she can have some fun and be inventive. They’ll easily attach anywhere, such as on the hooves, body, and face. Plus, the sequined material is reversible, allowing your little girl to admire the changing colors. 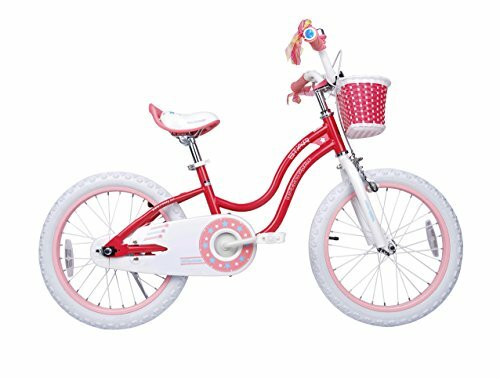 This pink and white bike will let your child expel that pent up energy and enjoy the sunshine too. It’s constructed from durable materials with rubber gripping tires. There’s a chain guard for safety. Hand and coaster brakes are included. Of course, all little girls will appreciate the pink streamers. The basket on the front also means she can bring toys or other belongings along for the ride. The training wheels are going to help boost her confidence — when she’s ready, they can be removed. A helmet not included, but definitely essential. Your 6-year-old girl may be growing up, but she still might like pretending she’s a princess. 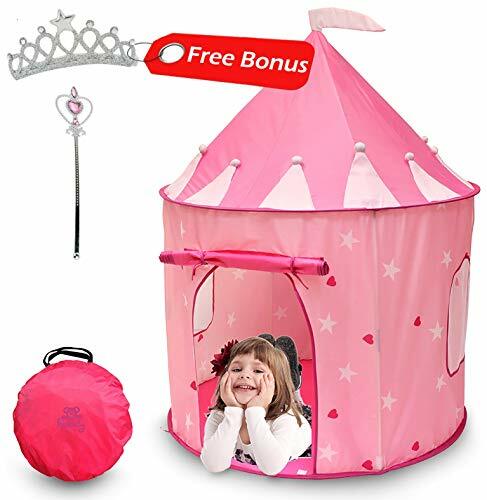 This pink castle tent is amazing for encouraging her imagination and roleplay with friends. It’s made from durable polyester material — perfect for indoor and outdoor play. The fiberglass rods provide the stability this tent needs and there are ground stakes to make sure it stays in place. It’s easy to set up and it can be folded into the carry bag for storage. What’s more, there’s a glittery tiara and wand included. There’s no doubt we’ve got some fantastic toys for 6-year-old girls on our list. Whether you’re looking for a crafting project or challenging game, we hope you’ve managed to find something to fit the bill. Our favorite has got to be the Micro Sprite kick scooter. It’s lightweight, foldable, and great for encouraging active play. Kids are always full of energy and having a scooter will give mom a break. Do you have a favorite toy on the list for your 6-year-old girl? We’d love to know, so leave us a comment down below.